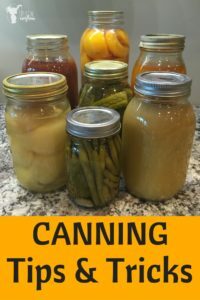 This post is full of canning tips and tricks to help you in your canning adventure! I grew up canning a lot of food with my family, and I continue canning yummy food for my kids. Here are all of the supplies that you will need when you are canning. Quart Jars (If you buy your jars new, they come with the lids and rings already) You can buy big mouth or small mouth jars. Either works great. Big mouth jars are a little easier to put fruit like peaches in. Tip #1 – Before you start anything, get out your water bath canner and fill it up with water. Once it is 3/4 full turn on the heat, and start warming all of that water up. This will help the processing part go faster. There is a lot of water in there, so start warming it up first. Tip #2 – Next clean your bottles in hot soapy water, or do a quick cycle in you dishwasher. I like to wash them in the sink really fast, because my dishwasher usually has dirty dishes in it. Make sure your bottles has lids and rings. 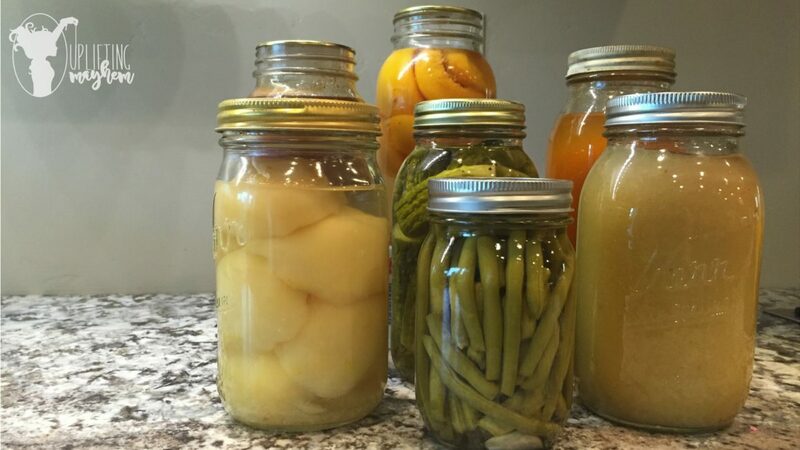 After you wash your bottles, start preparing your fruit, meat, veggies for canning. In lots of books it says to place your sealing lids in water and warm them up. I don’t do this, and I never have a problem sealing my bottles. It eliminates 1 step from the whole process. Tip #4 – Make sure you wipe off the rim of the bottle clean before placing your sealing lid on it. This makes sure that you have a clean seal! Tip #5 – When you are putting your ring on the bottle over the sealing lid, don’t tighten it too tight. If it is too tight it may not seal. Just lightly tighten the rings. Tip #6 – Don’t be surprised if one of your bottles breaks while it is processing. It is nothing that you did wrong. I always break at least one bottle every year. Some bottles just get old, or have a defect in them. This will prevent your jars getting a cloudy film on the outside of the jar. It won’t hurt your food if you don’t add vinegar, but it looks and feels better. Depending on what elevation you live at, will depend on the processing time. The higher you are the longer the time. Here is a chart to follow. (EX: If you are canning pickles and the processing time is 20 minutes, you will ADD the necessary elevation time to your 20 minutes. 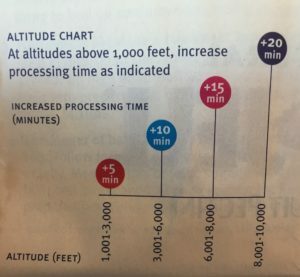 I live at 6,000 ft so I would process my pickles 30 minutes). Tip #9 – Place your bottles on your counter to cool for at least 24 hours. I tend to leave them there longer so I can admire them! When you take your bottles out of the water bath and place them on your counter, you will begin to hear little popping sounds. Those sounds are a canner’s best friend! Those popping sounds mean your jar is sealing. Sometimes the liquid can overflow from the jar from processing making your jar a little sticky. Just wipe it off before you store it! Tip #11 – Enjoy your hard work all year long! !